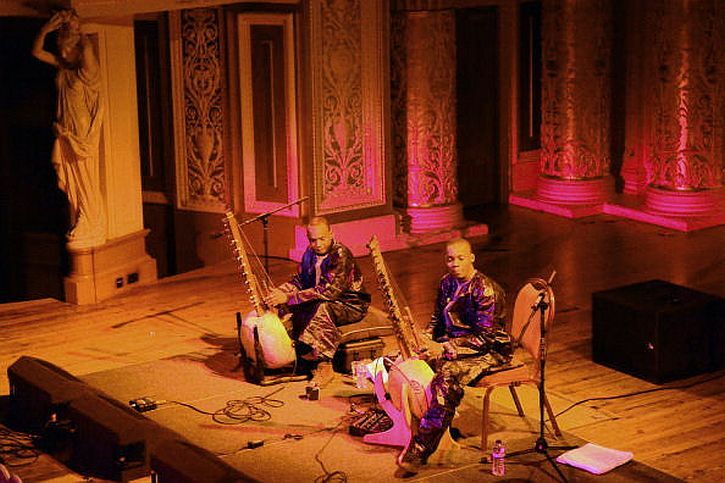 News out of Mali has been so dreadful this past two years that there was something extra-celebratory about the concert this Tuesday evening in the elegant, gilded surroundings of St Georges Hall Concert Room in which the world’s greatest kora player Toumani Diabate performed duets with his son Sidiki, the latest in a family of griots whose lineage stretches back 71 generations, father to son. Toumani (who speaks pretty fluent English picked up when he lived in London for a while in the 1980s) didn’t mention the crisis that struck Mali in 2012 and 2013 when jihadist forces gained control of two-thirds of a country rich in music and ancient learning, and distinguished by a culture rooted in a relaxed and tolerant Sufi Islamic tradition. But he was in Liverpool to play music from Toumani and Sidiki, the new album which he regards as a contribution to the healing process in post-conflict Mali. It’s a collection of very old, recently rediscovered kora pieces which Toumani chose to give new titles, honouring people and institutions that he believes played a crucial role in preserving Mali’s dignity. Sidiki came on stage first to play a solo piece, suggesting that already at 24 years of age, he has already absorbed much through his apprenticeship to his father. In addition to being the latest addition to the celebrated Diabate musical dynasty, back home in Mali, Sidiki is a star in his own right having established a huge following as a hip-hop musician and record producer. As a teenager he enrolled in the National Institute for the Arts in Bamako, taking up drums and learning digital recording techniques, and in 2013 – as his father proudly informed the Liverpool audience – he won the Malian Hip Hop Award, being voted Mali’s best beat-maker. Like his father, Sidiki has been outspoken in defence of his country’s freedom. In 2012 he teamed up with rapper Iba One to record ‘On Veut La Paix’ (‘We Want Peace’), an all-star rap hymn to peace in Mali, released as the jihadist forces were outlawing music in the areas they controlled in the north of the country. Take the bone-dry shell of a large gourd, a straight length of rosewood and a piece of cow or antelope hide, combine them with 200 years of craftsmanship and 21 strings, and you have the kora: sub‑SaharanAfrica’s most sophisticated native instrument. Then take a man or woman born to the task of reciting epic poetry from memory and picking the ripest words out of the air to praise or placate – now you have a griot: the hereditary bard of West Africa. Put kora and griot together, and you have the foundations of West African music and culture. The St Georges audience responded warmly to each number with lengthy applause. Towards the end Toumani spoke for several minutes about being the descendent of 70 generations – ‘stretching back father to son, father to son’, while Sidiki, speaking in French and with a smile on his face, spoke of the complications of his apprenticeship with Toumani – ‘his father, and at the same time his master’. Toumani made some sharp comments about Europe’s relationship with Africa by way of introduction to their final number – the delicate and lovely tune from the new album which he named ‘Lampedusa’, a moving tribute to the 360 migrants from Libya who drowned when their boat sank off the Italian island of Lampedusa in October 2013 while the album was being recorded in London. Whilst the European media promote a distorted picture of life in Africa as consisting of no more that starvation and war, equally Africans gain an unrealistic impression of Europe as a place where there is no poverty, no one goes hungry, no-one is homeless, and there are jobs for all. At the conclusion of ‘Lampedusa’ Toumani and Sidiki left the stage to rapturous applause. There is the bravery of those who save other humans from certain death (this week, for example, Nicholas Winton, the man who rescued 669 children – mostly Jewish – from almost certain death in the Nazi concentration camps, celebrated his 105th birthday). And then there is the bravery of those who, at great personal risk to themselves, save irreplaceable books or other cultural treasures from being destroyed by armed forces driven by ideologies which have no interest in freedom of expression. Such is the story, told in today’s Guardian, of the brave Malians who smuggled hundreds of thousands of ancient books and manuscripts out of Timbuktu after the city had fallen to Ansar Dine (Defenders of the Faith), the jihadist affiliate of al-Qaida in the civil war two years ago. It was a time of devastation in northern Mali: first the rebels pillaged the town, then the jihadis imposed a brutal form of sharia law on the population. Women were beaten for walking in the company of men. Music, a vibrant part of Malian culture that has been exported all over the world, was banned. Suspected thieves had their hands or feet chopped off after summary trials. The largely moderate Muslims of Timbuktu were terrified. “When [the rebels] entered the city, people said if you were an artist they would cut out your tongue, because they hate music and want to ban it,” Bintu Dara, a singer, tells me in the Malian capital, Bamako. “One of my cousins was beaten in front of me, given 100 lashes from the jihadis,” she says. “My drum player was caught and put in jail. One of my relatives’ sons was the first guy to have his hand cut off.” Dara fled soon after, along with an estimated two-thirds of Timbuktu’s citizens. Timbuktu is a Unesco-listed world heritage site, the cultural and spiritual capital of sub-Saharan Africa. 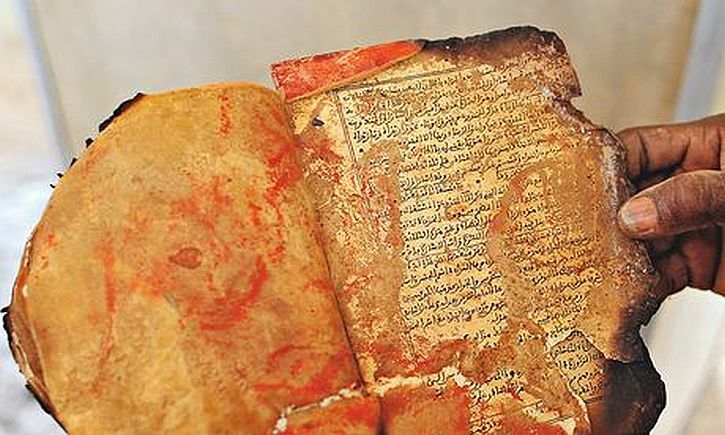 Many cultural artefacts were destroyed or damaged during the first week of the occupation – the shrines of Sufi saints were hacked to pieces, priceless medieval manuscripts were burnt. It was then that Abdel Haïdara and a group of brave and dedicated assistants decided to act. Haïdara manages the largest private library in the city, a library he can trace back to a 16th-century ancestor. He also runs an organisation, Savama-DCI, that represents other private manuscript collections. Charlie English recounts the dramatic and inspiring story of how Haïdara and his assistants succeeded in saving almost 400,000 manuscripts, moved in thousands of lockers, each of which was the size of a small trunk. The Encyclopedia Britannica states that by 1450 Timbuktu had a population of 100,000, a quarter of whom were students. Even if these figures are wildly exaggerated, Timbuktu was a thriving centre of learning, and manuscripts were highly prized: the traveller Leo Africanus, who visited in 1510, found books sold for more money than any other merchandise in the city’s market. 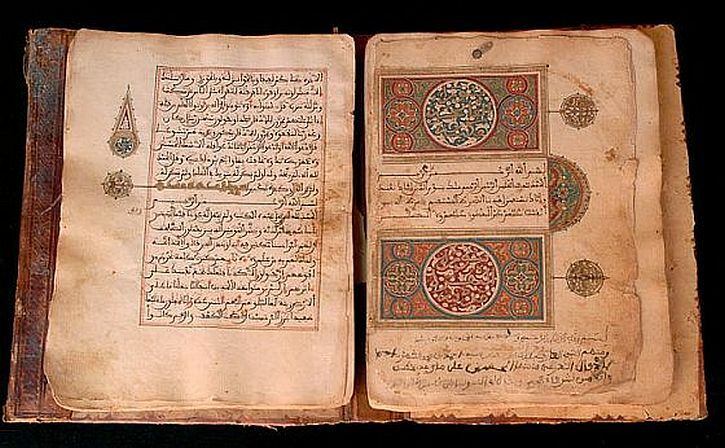 Books reached Timbuktu by caravan from Fez and Cairo, Tripoli and Córdoba, and what the scholars couldn’t afford, they would copy. Other documents were written in Timbuktu. The vast libraries that resulted included every subject: astronomy and medicine, law, theology, grammar and proverbs. There were biographical dictionaries, diaries, letters between rulers and subjects; legal opinions on slavery, coinage, marriage and divorce; the lives of Muslims, Jews and Christians; there were histories and poetry. In his Description of Africa, published in 1550, the traveller Leo Africanus marvelled that in the bustling markets of Timbuktu, under the towers of its majestic mosques, the richest traders were booksellers. 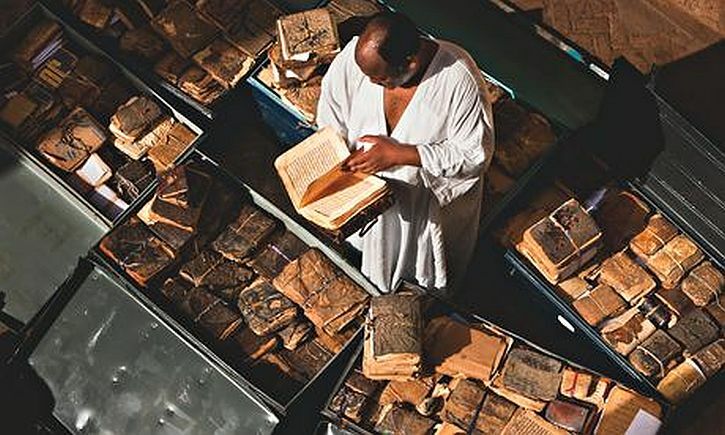 I recall seeing, several years ago, a BBC 4 documentary in which Aminatta Forna told the story of the lost libraries of Timbuktu and their long-hidden legacy of hundreds of thousands of ancient manuscript. She spoke, too, of Timbuktu’s university, founded around the same time as Oxford, and of the legacy of learning preserved in the manuscripts of Timbuktu – the classical Greek heritage copied and preserved in the middle ages, the history and laws of Mali and Songhai, chronicles of the families of Timbuktu, the poetry and stories of north Africa. Yet when European empires scrambled for Africa in the 19th century, Africans were regarded as primitive illiterates, with no history or literature. In An Inventory of Al-Mutanabbi Street: a hymn to the book and the word, I wrote of seeing, in Manchester’s John Rylands Library, the project conceived by poet Beau Beausoleil and artist Sarah Bodman to ‘re-assemble’ the ‘inventory’ of reading material that was lost when a car bomb exploded in al-Mutanabbi Street, Baghdad, on 5 March 2007 – an attack in which more than 30 people died and many more wounded. In the third post I discussed Melvyn Bragg’s week-long In Our Time special, The Written World, broadcast over one week on BBC Radio 4. Bragg’s thesis was that writing was the greatest human invention, and the focus of the series was the technology for recording words – tablets, manuscripts and books, each of which in some way represented a turning point in the history of ideas. The first time I saw Rokia Traore live was in 2004. I’d travelled to Oldham to see her perform in the tiny back room of a pub. The night before, in Edinburgh, she had been presented with the BBC Radio 3 World Music Award (Africa section). It was a memorable evening: the intimate setting, an acoustic set with Rokia’s exquisite, breathy vocals accompanied only by a guy on water calabash and a young woman who joined her on vocals and in some wild dancing. Monday night’s gig at the Royal Northern College of Music couldn’t have been more different: a large hall, packed with an enthusiastic audience clearly familiar with the five albums that Rokia now has to her name. And the sound: apart from one delicate number during the encores, this was a hard-rocking show. Currently touring Britain to support her new album Beautiful Africa, Traore has assembled a band that blasts out a driving hard rock sound, albeit that her songs and elements of the music draw deeply from Malian tradition. Beautiful Africa is a rock album, celebrated as such by Traore herself. Of late, she has been wedded to the sound of an old Gretsch guitar, a sound unfurled on her gorgeous 2008 album Tchamantché. On that and the latest CD, Malian n’gouni, classical harp, and kora are blended with the Gretsch, as well as acoustic guitars, layered in staggered rhythms with snares, drum kit, and percussion. On disc, the instrumentation is sparse, contrasting the Gretsch with subtle percussion effects or the n’goni, the tiny, sharp-edged West African lute that has always been a key element of her sound. Of course the folk guitar is the one I play very often, but I wanted a more electric sound. Not electric like the hard rock happening today. I wanted something more 1970s, 60s, 50s, and, of course, because of rock, my choice came very quickly to the Gretsch guitar. I tried it on one song and I was really satisfied, and finally all the rest of the album was composed around the sound of the Gretsch. I do not deny the quality of the musicianship demonstrated at the Manchester show: every member of the band was on top form, from the female bass guitarist (whose name I did not catch) to drummer Seb Rochford, the brilliant ngoni player Mamah Diabaté, and backing singers Fatim Kouyaté and Bintou Soumbounou. But I have to say that hearing the varied moods of songs from Beautiful Africa and the previous album Tchamantché uniformly steam-hammered by riffy repetitions of heavy electric guitar – well, I felt something had been lost. If there had only been some variation, a little space opened up in the aural landscape. 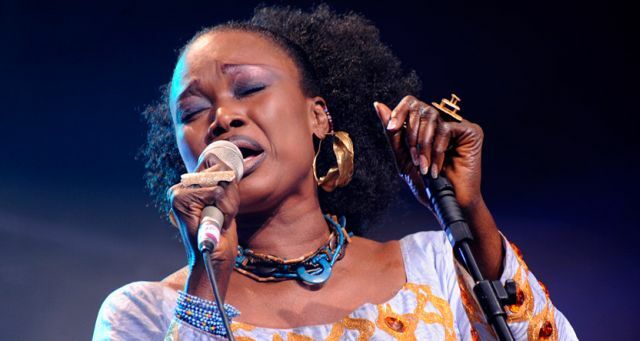 The set consisted entirely of songs from the last two albums – songs such as ‘Sikey’, ‘Ka Moun Ke’, ‘Tuit Tuit’, ‘Kouma’ and the title track from Beautiful Africa on which Traore addresses the unrest in her Malian homeland with impassioned words sung as wah-wah guitar and ngoni collide. It only leads to pain. Lord, give us wisdom, give us foresight. The evening had begun with Rokia playing the exquisite guitar figure from ‘Dounia’, the opening track on Tchamantché. When she begins to sing you realise that where most female Malian vocalists tend to sing rather stridently, Rokia’s voice is intimate and almost understated. She’s the daughter of a Malian diplomat who was posted to the US, Europe, and the Middle East, and studied sociology in Brussels before embarking on her musical career. She sings mainly in her native languages, French and Bambara. I can’t do Malian traditional music because I don’t have that training. There are some specific schools for that, and I didn’t have the chance to learn how to do pure Malian traditional music – by traditional I mean not just classical, but music that is danced to and listened to in Mali today. I think this position that I have is suitable for me, because the interesting thing for me is to put together all my influences and all my experiences I got through my travelling with my father. My influences are jazz, blues, European classical music; they are rock music and pop music. So many kinds of music. Her love of jazz – and especially of Billie Holiday – was referenced during the encores when she sang ‘Gloomy Sunday’. Just before she recorded Tchamantché, Rokia was involved in a project called Billie & Me, with other vocalists, including Dianne Reeves: ‘I love jazz music and blues, and I used to listen to her,’ she told Pitchfork. Her own version of The Man I Love’ ended up on Tchamantché. Towards the end of the show Rokia remarked, rather grumpily, that we were ‘a quiet audience’. We probably were – it’s not easy to let your hair down when seated in the RNCM’s concert hall. But then Rokia and the band did a phenomenal job, getting everyone on their feet, clapping and stamping to a Malian-style praise song in which she name-checked and introduced the band members by name – as well as reciting in Bambara what sounded like their artistic cv’s. The number, which last for close on 20 minutes, just kept building momentum and energy, and brought the show to a tumultuous conclusion. The encores included the aforementioned ‘Gloomy Sunday’ sung acappella, the only song led by Rokia on acoustic guitar, before a final, rousing number with scorching dance moves by Rokia, Fatim Kouyaté and Bintou Soumbounou. My aim is clear to me. That tower over my own limits. Behind the enigmas of life. Your senseless hate will change nothing. In November and December 2011, Rokia performed a limited series of thirteen acoustic concerts, ‘a magnificent journey where voice and strings made tribute to the Mandingo tradition, a tribute to her own roots’. This full-length concert video shows a different Rokia Traoré to the one I witnessed the other night in Manchester. She’s joined by Mamah Diabaté (ngoni), Mamadyba Camara (kora), Habib Sangare (Bolon), Virginia Dembele (chorus), Fatim Kouyate (vocals) and Bintou Soumbounou (chorus). A full-length performance from the Beautiful Africa tour last summer, with some of the same band members. I’ve had it mind on several occasions in the past 12 months to write something about my love for the music of Mali, one of the world’s poorest countries that for two decades had been held up as a model of democratic progress in sub-Saharan Africa until last January when an armed insurgency resulted in Islamist forces gaining control of vast swathes of the north of the country, including the ancient cultural centre of Timbuktu. Earlier this week, before the French military intervention, Mali appeared to be on the brink of dissolution as Islamist forces pushed south towards the capital Bamako. Nowhere does music have a greater social and political importance than in the vast desert state of Mali. It is shocking, therefore, that it has been banned across much of the two-thirds of Mali currently controlled by Islamic rebel groups. Malian musicians have become household names in the west. The list is remarkable, from the late Ali Farka Touré to the soulful Salif Keita, from Toumani Diabaté, the world’s finest exponent of the kora, to the bravely experimental Rokia Traoré. Then there’s the rousing desert blues of Tinariwen, who have performed alongside the Rolling Stones. There is the passionate social commentary of Oumou Sangaré, and the rousing, commercially successful African pop fusion of Amadou & Mariam. These musicians, with varied, distinctive styles, have educated western audiences about Africa and their country’s ancient civilisation, and the way in which traditional families of musicians, the griots, had acted as advisers to the rulers and guardians of the country’s history, and kept alive an oral tradition for generation after generation. 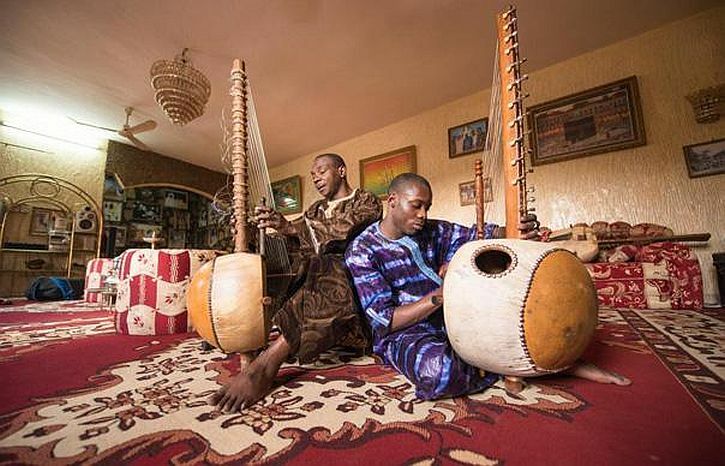 And yet, Denselow writes, ‘the Islamic rebel groups are trying to wipe out this ancient culture’ – and in the process have forced Malian musicians to examine the role they should now play. He quotes Manny Ansar, director of Mali’s celebrated Festival in the Desert, at a recent censorship conference in Oslo as stating that the Islamic militias are banning music in order ‘to impose their authority, so there’s nothing to threaten them’. ‘They are attacking the traditional chiefs and musicians. And they’re using concepts of Islam that are 14 centuries old.’ Young people have been stopped from listening to music and families have had their televisions smashed for watching music shows, but music was still being played underground, Ansar said. Her thoughts go out to them. ‘You can now say things about Muslims, in polite society and even among card-carrying liberal lefties, that you cannot say about any other group or minority.’Those were the words of Mehdi Hasan, writing a final comment piece for The Guardian on Tuesday. They came to mind as I stood before the remarkable portrait of an 18th century West African Muslim that is on display for a limited period at the International Slavery Museum in Liverpool. 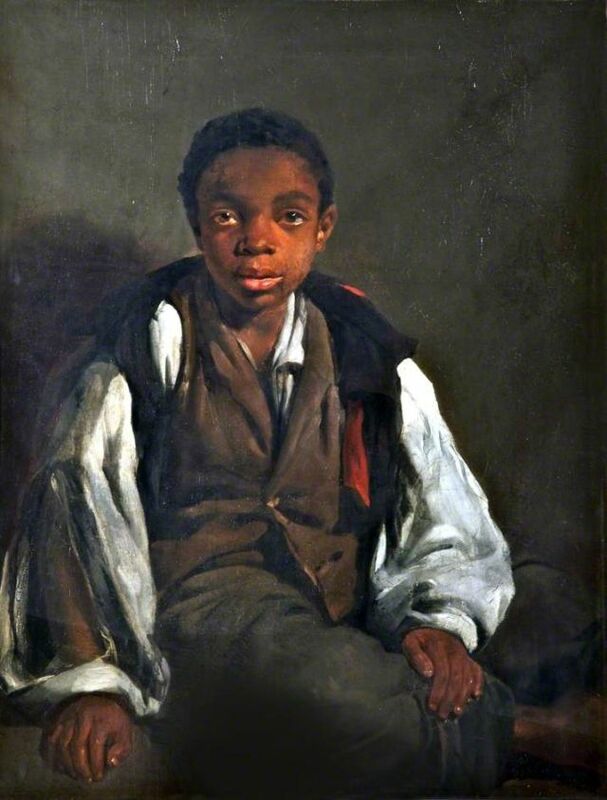 William Hoare’s 1733 portrait of Ayuba Suleiman Diallo is the earliest British oil painting of a freed slave – and the first portrait to honour an African subject and Muslim as an individual and equal. The Museum has given this one-picture exhibition the title, Faith, Slavery and Identity, noting that ‘Djallo had a lasting impact on our understanding of West Afrjcan culture, Black identity and the Islamic faith, but his life raises some uncomfortable questions’. Ayuba Suleiman Diallo was born into a family of Muslim imams in West Africa in 1701. In 1731, while on a trading mission to the River Gambia to sell two black slaves to the English ship Arabella, Diallo was kidnapped, sold into slavery, and transported to Maryland where he was made to work on a tobacco plantation. Diallo (known also as Job ben Solomon) escaped, was caught and imprisoned but permitted to write a letter to his father that came to the attention of James Oglethorpe, Deputy Governor of the Royal African Company. Oglethorpe was so moved by the letter that he arranged for Diallo’s purchase and passage to England. Diallo arrived in London in 1733. Recognised as a deeply pious and educated man, Diallo mixed with high and intellectual society and was bought out of slavery by public subscription. His portrait was painted that same year by William Hoare, an accomplished artist, who painted many members of Georgian high society. Diallo was himself a high-status, educated and wealthy individual from a family of Muslim clerics. He was born in Bundu (now on the Senegal-Mali border) in West Africa, and as well as his native language, was fluent in Arabic and later learned English while enslaved. 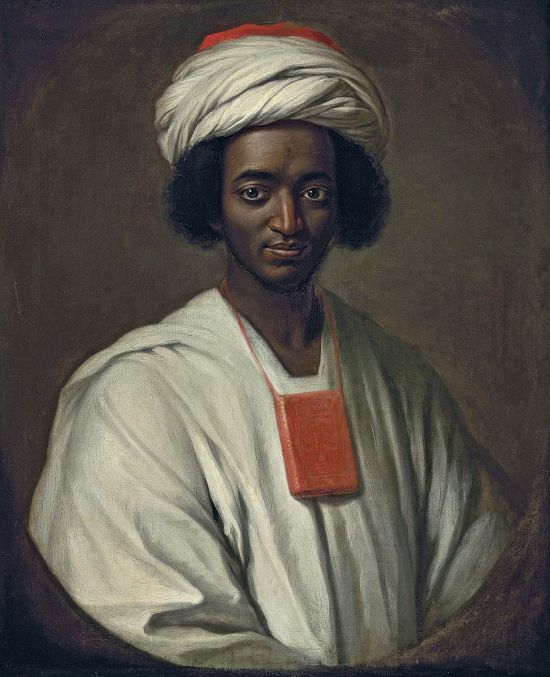 Hoare’s painting depicts Diallo as a man of intelligence, character and compassion and was made at the time when there was a new interest in Islamic culture and faith in Britain, a reflection, perhaps, of more tolerant values during the Enlightenment. Through the publication by Thomas Bluett of his Memoirs in 1734, Diallo had an important and lasting impact on an understanding of West African culture, black identity and the Islamic faith. Bluett was on the same ship that brought Diallo to England, and in Some Memoirs of the Life of Job, concluded that Diallo was ‘no common Slave’. Freed from slavery with money raised by public subscription, arrangements were made for Diallo’s return to Africa – a rarity for victims of slavery. Returning to his home town, Diallo learned that during his absence his father had died, the country had been ravaged by war and his wife had remarried. Slaves were an accepted part of most African Islamic societies. Many were prisoners of war, although exceptions could occasionally be made if prisoners converted to Islam. The Koran proclaimed that to free a slave was a most praiseworthy act, but although Islam arguably promoted the more benign treatment of slaves (women were generally not separated from their children, and masters did not have the power of life and death), human rights of Muslims and non-Muslims were sometimes still abused. Three years ago, the National Portrait Gallery raised £100,000 from private donors and won support from Heritage Lottery Fund and the Art Fund to acquire William Hoare’s portrait of Diallo but were beaten at auction by the Qatar Museum Authority. A temporary export bar prevented the portrait being whisked abroad and now a 5 year cooperative agreement has been reached to lend the painting to the NPG. The Qatar Museum Authority are supporting a programme of conservation and research on the work in London, and the painting will tour the UK before being exhibited in Doha in 2013. It could be read as an example of how European artists sometimes treated black people as picturesque subject matter. However, it can also, perhaps more convincingly, be seen as a straightforward realistic portrait. Windus was born in Liverpool and trained at the Liverpool Academy Schools. This poor boy dressed in rags is traditionally associated with a touching story with a suitably happy ending. He is said to have crossed the Atlantic as a stowaway and been found by Windus on the steps of the Monument Hotel in Liverpool. Windus is then supposed to have employed him as an errand boy. This painting was put in the window of a frame-maker’s shop. A sailor relative of the boy saw it, found the boy and took him back to his parents. It is unknown whether this story is true or not. Windus’ image of picturesque poverty would have had a strong appeal in Victorian England. It is also, however, a strikingly direct picture of a boy, shown in a matter-of-fact pose. It does not have any ‘humorous’ props or symbolic details that often accompanied images of black people from the time suggesting lowly status or social inferiority. It is simply an image of a poor boy, similar in style to many other images of the ‘lower classes’ produced at this time. There have been people of African descent in Liverpool since at least the 1700s. Some Africans were sold in the town in the 1760s and 1770s but very few enslaved Africans were brought to Liverpool directly from Africa. A number of merchants brought slaves from the West Indies to work as servants in their homes. Some African chiefs also sent their sons to be educated here and in the 1790s over 50 were at school in Liverpool. With the development of the palm oil trade after 1807, African seafarers were increasingly employed to crew the ships. Many of them settled on the outskirts of the town, in the area we know as Liverpool 8. The elites have become predators, self-serving and only turning to people when they need them. We can never all be equal, but we can ensure we do not allow excessive poverty or wealth. Inequality breeds insecurity. The state of any country’s environment is a reflection of the kind of governance in place, and without good governance there can be no peace. Wangari Maathai’s Green Belt Movement is led by and for rural Kenyan women. What began with planting a few tree seedlings grew to forever reshape the political landscape of Kenya and the world. Maathai trained thousands of women on everything from water conservation to civic leadership, and to date, they’ve planted 35 million trees in a country devastated by deforestation. Along the way, they also helped overthrow a dictatorship. The tree is just a symbol for what happens to the environment. The act of planting one is a symbol of revitalising the community. Tree-planting is only the entry point into the wider debate about the environment. Everyone should plant a tree. And you can hear the fluttering of a butterfly’s wings when you read that after graduating from high school in 1959, she won a scholarship to study in the US, as part of the ‘Kennedy airlift’ in which 300 Kenyans – including Barack Obama’s father – were chosen to study at American universities in 1960. After her return from the US, Maathai became increasingly involved in environmental causes and activism. In 1977, the first ‘Green Belt’ action in Nairobi instigated what became the Green Belt Movement. Maathai encouraged women throughout Kenya to plant tree nurseries in their villages, searching nearby forests for seeds to grow trees native to the area. She agreed to pay the women a small stipend for each seedling which was later planted elsewhere. Presenting her with the Peace Prize in 2004, the Nobel committee hailed her for taking ‘a holistic approach to sustainable development that embraces democracy, human rights and women’s rights in particular’ and for serving ‘as inspiration for many in the fight for democratic rights’. The top of the pyramid is blinded by insatiable appetites backed by scientific knowledge, industrial advancement, the need to acquire, accumulate and over-consume. The rights of those at the bottom are violated every day by those at the top. The economic and political systems are designed to create more numbers, population pressures show no sign of waning, deforestation and desertification continue. The people at the top of the pyramid do not understand the limits to growth and they do not appreciate that they jeopardise the capacity of future generations to meet their own needs. It’s not just planting trees – it’s the reasons why trees are planted, it’s the social side of how the tree-planting works, it’s the political work that goes alongside tree-planting, and it’s the vision that sees loss of forest as translating into loss of prospects for people down the track. There is, in some parts of the world, a backlash now against these ideas. Every couple of days an email comes into my inbox asserting that the way to help poorer countries develop is to get them to exploit their natural resources as quickly and deeply as possible with no regard for problems that may cause. Organisations promoting this viewpoint are not, to my knowledge, based in the developing world but in the Western capitals that might make use of the fruits of such exploitation – cheaper wood, cheaper oil, cheaper metals. It is the opposite of sustainable. It is the people who must save the environment. It is the people who must make their leaders change. And we cannot be intimidated. So we must stand up for what we believe in. I went over to the RNCM in Manchester last night to see the event billed as ‘An Evening with Baaba Maal – Tales from the Sahel’. The music – an intimate performance by Baaba himself, with Jim Palmer on drums or additional guitar and Mamadou Sarr on percussion – was sensational. But the format of the evening was a little disappointing, with a vociferous section of the audience becoming pretty restless after a while. The advance details for the event stated that ‘Tales from the Sahel will feature ancient Fula stories from Senegal; a discussion between Baaba Maal and the UK playwright and journalist Kwame Kwei-Armah about how such mythological tales have led to the inspiration that is modern Africa; and performances of songs that have emerged from these two apparently divergent strands’. But there were no ancient Fula stories and the ‘conversation’ between Kwame Kwei-Armah and Baaba was far from revalatory, especially for an audience that was pretty evidently very well-informed about Baaba Maal and his music. The stage was set with a table and chair for each of the two conversationalists, flanked by Maal’s guitars, Palmer’s drums and Sarr’s djembe, sabar and water drum. Kwame Kwei-Armah kicked off by saying the evening would consist of an unprepared conversation betwee himself and Baaba Maal, explaining that they had met in Dakar last year when he was artistic director of the 3rd World Festival of Black Arts and Culture, and that the inspiration for the evening’s format came when Kwame spent an evening at Baaba’s house there. As the night went on, the house bustled with friends and acquaintances dropping by, engaging in animated, freewheeling discussions about everything under the sun, with Baaba, fluent in a variety of African and European languages, translating from one to the other for the benefit of those present. The trouble with this element of the evening was that Kwame Kwei-Armah’s chat with Maal wasn’t especially probing or revealing for anyone who has perused their Baaba Maal CD notes or read interviews with him. Too much of it was along the lines of Armah saying things like, ‘what a fantastic gig – me on stage with the great Baaba Maal, and getting paid for it!’ We did learn about the important influence of Baaba’s mother (who sang for pleasure at weddings and other ceremonies) and his father’s very different musical preferences. He was a fisherman, he sang religious songs, and was fundamentally opposed to the idea of a son of his singing popular songs. His mother also influenced Baaba Maal’s views about women in African society – her experience of polygamy was an unhappy one, as is that of most women in polygamous marriages, according to Maal. The conversation also made plain the enormous debt that Baaba Maal feels he owes to his lifelong friend and mentor Mansour Seck. Since his father was a fisherman, Baaba Maal was expected to become a fisherman as well. However, under the influence of Mansour Seck, Maal devoted himself to learning music from his mother and his school’s headmaster. In 1974, after his baccalauréat he chose to study music while also taking a fine arts course in Dakar. In this way he was able to convince his father that he was training to become a teacher – albeit a teacher of music. However, he and his old friend Mansour Seck and were soon recording musical performances at the radio station. He persuaded the stationa announcer not to mention his name, but eventually his performances became so popular that, one day, the announcer let slip his name – and his father found out. Little of this would be news to most of those in the Manchester audience who, an hour into the session, with the musical interludes short and the conversation extended, were getting restive, with calls for ‘more music!’ Armah seemed to recognise the way things were going, abandoned a promised audience Q&A with Maal, and handed over to the musicians. They completed the show with three or four numbers that moved from contemplative passages in which Baaba Maal’s voice soared above his acoustic guitar, to storming finales driven by Mamadou Sarr’s thunderous percussion. Sections of the audience shook free of the format’s shackles and danced – one or two joining the musicians on stage, where Sarr whipped them to a frenzy. Baaba Maal was born in 1953 in Podor, in the Fouta province, Senegal. That makes nearly 60 – something very difficult to believe, with his still-youthful appearance. He is of the Toucouleur or Haalpulaar (pulaar-speaking) people, of northern Senegal, sings primarily in Pulaar and is a deeply-committed promoter of the traditions of the Pulaar-speaking peoples who live on either side of the Senegal River in the ancient Senegalese kingdom of Futa Tooro. He spoke passionately about his home town, which has featured in several of his songs. In 1982 Baaba Maal completed his musical training in Paris at the Conservatoire. Mansour Seck joined him and they began touring in various European countries. In Brussels they recorded their first album, Djam Leelii. I can still remember when the album was released in 1989 in the UK, bringing home the vinyl lp with its emblematic cover featuring a room, photographed through a doorway, that contained traditional wooden furniture and a modern matt black stereo system, red LED glowing. I recall the moments when the first notes of the opening track, Lam Tooro, flooded the room. Like the rest of the album, it was beautifully hypnotic, with the two musicians’ guitars and Baaba Maal’s ethereal voice, accented by dabs of African percussion, producing pure magic. It remains one of my most treasured albums, amd Baaba Maal’s best in my view. In July 2003, Baaba Maal was appointed as a Youth Emissary for the United Nations’ Development Programme. As part of his role, the musician-ambassador devoted a significant amount of time and energy to raising young people’s awareness of AIDS and HIV. In 2006, Maal organised the first Les Blues du Fleuve (River Blues) festival in Senegal. The festival has become an annual spring-time event, linking the countries that border the Senegal River and involving all branches of the arts from music to painting, crafts and public lectures.